“These are all great cymbals, the best of the best by this fantastic company. These are new cymbals for sale, specially selected by Todd Bishop— read about how Todd chooses these cymbals. In all types and weights of cymbal, we look for an excellent, defined ride sound, responsiveness to accents with the shoulder of the stick, an explosive crash, and a strong, musical bell sound. All cymbals are good for both riding and crashing, and handle well at all dynamics from extremely soft to very strong. Sticks used in 2019 videos are Bopworks Birdland model, and Vic Firth SD-4 Combo. In older videos Vic Firth SD-11 Slammers are used. Email us to request a personal special selection of a cymbal model not listed here. Visit our YouTube page for video archives of all cymbals. 3/2/19 NEWS: Videos for all of the latest batch of cymbals are up! Newer cymbals are first. Archived list of sold cymbals is at the bottom. Classic dark, deep jazz sound. Sound reminiscent of Art Blakey’s 20″ ride played on The Big Beat and Indestructible. Also compare to the cymbal “Richard” below. High, dark jazz sound. Moderately complex harmonic profile. Very controllable, defined ride cymbal, considering its light weight. High, dark jazz sound. Moderately complex harmonic profile. Very controllable, defined ride cymbal, considering its light weight. Handles like a traditional medium. Pleasingly bright light ride. Crashable, but with good stick definition through a range of dynamics— the wash does not over ride the stick sound. Strong bell. Crash sound has a lovely high peak. 4 rivets. Pleasingly bright light ride. Crashable, but with good stick definition through a range of dynamics— the wash does not over ride the stick sound. Strong bell. 4 rivets. Medium jazz ride. Solid enough to function as a main ride where a higher sound is desired, or for travel. Good candidate for added rivets. Clean, dark, classic jazz sound. Responsive to crashing, also great for light riding. This could be labeled a Crash-Ride, or Medium Thin Crash. Medium jazz ride, moderately dark, cutting stick sound. Solid enough to use as a main ride. Does not quite open up for an explosive fortissimo crash, but accents very nicely with the shoulder of the stick. Good candidate for adding rivets. Bright, responsive, crash ride; good for light riding, crash sound peaks nicely. Custom Turk-style— unlathed top, lathed bottom. Dark, clean, and very dry. Great cymbal for low volume situations, recording, rehearsals. Turk style— or as C&G smiths say, “Krut.” Crashable ride cymbal with very defined stick sound, strong bell sound. Small, but solid enough to function as a main ride. Bright, airy, high-pitched thin-to-medium thin crash. Crash sound has a strong, cutting peak. Good for light riding in acoustic situations. Light, pleasingly bright, splashy, with a good, non-mushy foot sound. Great cymbals at a bargain price. 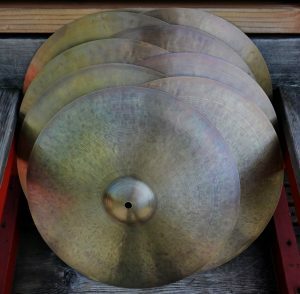 These are BARGAIN grade cymbals— they were used by an endorser and returned. They are in new condition, except they have been handled and played a bit. They do not have a C&G stamp or label. Bright, chunky medium hihats. Excellent all-purpose hihats at a bargain price. These are BARGAIN grade cymbals— they were used on a gig by an endorser and returned (he wanted something heavier). They are in new condition, except they have been handled and played a bit. Categorized as a crash-ride, but this is more of a light-medium ride. A classic clean jazz sound. Does not quite open up for an explosive fortissimo crash, but accents very nicely with the shoulder of the stick. Sticks used are Bopworks Birdland model, and Vic Firth SD-4 Combos. Full, responsive, lower pitched, all purpose medium-thin crash. Powerful crash sound. Fine for light riding in a jazz setting. Sticks used are Bopworks Birdland model, and Vic Firth SD-4 Combos. Lovely, lush, complex, thin hihats. Relatively soft foot sound, with a beautiful sizzle played half open. Sticks used are Vic Firth SD-4 Combos. Medium hihats, high pitched, pleasingly bright timbre. Solid foot sound. Excellent, musical, all-purpose cymbals, good for jazz, as well as music where more cutting power is needed. Sticks used are Vic Firth SD-4 Combos. Great cymbals at a bargain price! This would be a wonderful set of Holy Grail hihats, but someone at the factory dropped them, and there are dings on the edge of both cymbals— approximately 2-3mm. I think that is what’s commonly called a “flea bite”— it should not significantly effect the life of the the cymbals. The patina looks nice, but is somewhat more irregular than is normally expected. As factory seconds they do not bear a C&G cold stamp or label. Sticks used are Vic Firth SD-4 Combos. A great jazz cymbal, with a focused, controlled sound. Cool, deep bell sound, and a big deep crash. See video of the unpatinated cymbal. Great, solid jazz ride, more complex harmonic profile than Richard. Custom unlathed “Midnight Lamp” series. Light ride, smaller bell than Holy Grail rides. Fundamentally low pitched, with a very low cushion of sound. Great definition, controlled sound, as expected with unlathed cymbals. Great for low volume playing, recording, and practicing. Great, musical light-medium ride for all kinds of music. Traditional sound with cutting power. Video. Large bell and wide flange, medium-thin in weight. Great sounding Chinese-style cymbal. Very responsive for soft or loud accents, good for light riding. Video. Medium-thin crash that makes a great crash-ride. Doesn’t build up when riding. High pitched but dark sound. Pleasant, delicate bell sound. Video. Solid medium thin crash, decent for light riding. Video. Funky low pitched (for the size) crash with unusual patina and hammering. A few C&G cymbals have a “dead” quality I really like— they sound like old cymbals that have been played a lot. This is one of them. Another nice quality of C&G crashes is that they tend to ride extremely well, while also being very responsive as crashes— again, that’s this cymbal. Video. Archived listings of sold cymbals. Visit our YouTube page to compare sounds of these cymbals. Big, live jazz sound; somewhat splashy crash sound; deep, mellow bell. Video. Dark, with great definition; fast crash. Deep bell sound. Video. Excellent jazz-weight cymbal. C&G jazz rides tend to be a little heavier than the equivalent model of other brands, giving them better definition and projection, and a good bell sound, while maintaining the dark, complex sound favored by most jazz drummers. Higher pitched than Richard. Video. Light-medium jazz ride, controlled and focused, with great definition; responsive to accents, higher pitched. Good as a primary ride, and versatile. Video. Light-medium jazz ride, high pitched with a dark sound. Nice airy crash sound, cutting bell. Video. Classic dark jazz ride. Complex sound with good stick definition. Slight exotic edge on accents and crashes. Good as a primary ride! Video. Another solid classic jazz ride; very dark, great definition; responsive to accents. Video. Complex but solid jazz ride, excellent main cymbal. Long crash sound. 11/9/18 update: This cymbal is currently getting a special heavy patina, which will dry its sound. Video. Solid, musical, medium ride suited to all kinds of music. Lighter in weight than major-manufacturer medium rides. Excellent definition and a clean tone, strong bell sound and not-quite-explosive crash, while still having a warm, deep, old-A sound. I find that C&G’s medium weight cymbals handle soft playing very nicely. Video. Brighter, “A”-like sound, but musically complex, the 20″ Mersey Beat makes an excellent jazz ride cymbal, especially as a left-side cymbal. Freddie is lower pitched than other examples of this model we have played. All 20″ Mersey Beat cymbals have four rivets, at 12, 3, 6, and 9 o’clock. Video. With four rivets. Bright and clean, with enough complexity to be interesting. Musical crash and bell sounds. Video. Solid-performing medium weight jazz ride. Classic jazz sound with excellent projection. Video. Another great medium thin crash. All three of these 18s are great left side cymbals for bebop. Video. This is a special line of cymbals by C&G’s lead smith, with superfine lathing and a bright finish. They are very lush and responsive, with an unusual harmonic profile— fairly subtly so with this cymbal. Zénon has a big, full crash sound, and also handles light riding very well. Video. This is a Cymbal & Gong classic— beautifully blended, complex, warm crash sound with no off-harmonics. Outstanding crash sound. It’s such a responsive crash that it doesn’t ride quite as well as Bastien below… but 16″ is typically a little small do much riding on anyway. Video. Wonderful, very versatile semi-dark, thin cymbals. Solid foot sound, great sizzle. Video. These large hihats are becoming a very popular item. If you’ve ever played any old, very thin K hihats, Otis is the giant Chrysler Imperial version of that. It’s hard to describe these cymbals with normal words: dark, massive sizzle; traditional mooshy foot sound; chunky/funky stick sound; whooshing open sound. Listen to Charli Persip play with Gil Evans to get an idea of the family from which these cymbals come. Video. Excellent, very playable A-type light-medium ride. All of C&G’s medium rides are crashable, with a good balance between clean and complex harmonic profile. They would never be mistaken for a modern A-type cymbal by a major brand. This cymbal has a warm, relatively clean sound, long sustain, and an awesome, very full, musical crash sound at fortissimo levels. It will make a good jazz ride, or medium ride in settings where a live, full-sounding cymbal is called for. A minor technical flaw in the manufacturing process means you get a big discount on this cymbal. There’s a slight flaw with the lathing— the lathed-away metal is stuck in the grooves in a few spots. Only visible on close inspection, there is some light surface roughness in those spots. This makes no detectable difference in sound, and will not affect the life of the cymbal. Tim at Cymbal & Gong tells me you could go in with a dental tool and remove the stuck bits, but you will probably just play it as is.